Handcrafted Metal makes exquisite L shaped custom stainless steel kitchen bar to suit your taste and accommodate your kitchen. With us you can customize every dimension and feature. You can also add detailing, such as fancy edges, backsplashes, hammering, and drainboards, to give your stainless kitchen bar a powerful presence in your kitchen. Each stainless kitchen bar is fully welded and polished, and made with 14 gauge stainless steel, which is 25% thicker than 16 gauge. Feel free to choose how your L shaped stainless kitchen bar will look, by combining our custom features into the perfect custom stainless steel kitchen bar for your kitchen. We will work with you to produce a work of art for your kitchen. To get started, click any of the L shaped kitchen bar or countertops below to see pricing and customize your dimensions and features. A convenient eating area is created by this peninsula with angled corners. The peninsula features our bevel edge on all sides. The long section has a window notch that cuts low into the backsplash, and a marine Normandie edge across the front. The sink includes a smooth drainboard on the right side. 14 gauge all welded stainless, micrograin finish. This L countertop is a well-equipped commercial grade food handling work center with 3/4" radius corners for easy cleaning. The large sink, ribbed drainboard, and backsplash behind put water firmly under control. A smaller vegetable prep sink on the left provides a separate work area. Marine edges on left end and front control spills. All welded 14 gauge stainless steel, micrograin finish. This large L top features out sparkle matte finish on the deck and in the sinks, and butterfly finish on the backsplashes. The marine bullnose edges control water, and spherical corners soften the shape. The right hand deck extends out seamlessly into 2 appliance garages. 16 Gauge Stainless, Sparkle Matte deck finish, butterfly splashes finish. To conserve countertop space, the 2 sinks were arranged to nestle into the corner of this L top. Space constraints required one corner of the larger sink to be angled. We were able to fit in a faucet for each sink, even with the tight space constraints. All welded 14 gauge stainless, micrograin finish. This partial wavy splash adds a whimsical touch to this eye catcher. The butterfly finish on every surface, including the backsplashes and sink, makes this dazzling top a focal point in the kitchen. There are also two trash chutes with custom covers that are nearly invisible at the right end. The entire piece is made from smooth stainless, butterfly finish. This sparkling bartop changes and shimmers as you move around it, reflecting the light from different directions. The bullnose edge and spherical corners give this seamless bartop a solid, substantial look. It's made entirely from smooth stainless, and has our Butterfly finish. This single piece L countertop features a double sink, and backsplashes on 3 sides. The micrograin finish follows the countertop runs, and changes direction at the corner. All welded 14 gauge stainless, micrograin finish. This L-Shaped custom countertop features an integral double-bowl sink with a drainboard. It has our "Claire" edge on the front, and a faucet hole behind the sinks. The entire countertop is made from 14 gauge #304 stainless steel, and has our stainless grain finish. Handcrafted Metal takes pride in our very high quality craftsmanship. We see your Stainless Steel Kitchen Bars and Counters order as an opportunity to deliver our uncompromising design and craftsmanship. You can see that we offer a large number and an amazing variety of custom stainless kitchen bars designs. Our 25 years of experience in building stainless kitchen bars in every size, shape, and color gives us mastery of the essential methods, processes, and skills needed to produce a stainless steel kitchen counter and bar that exceeds your expectations. 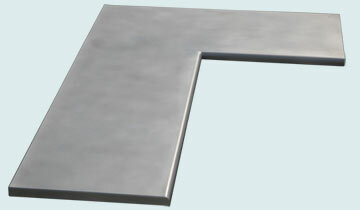 We have built thousands of Stainless Kitchen Bars and Counters. The vast array of styles, finishes, textures, and metals available for Handcrafted Metal Kitchen Bars and Counters provide almost unlimited choices. 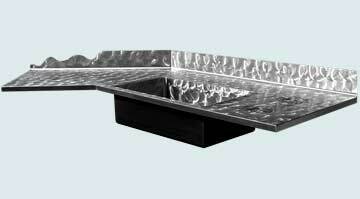 We offer an extensive selection of Stainless Steel Bar Counter. 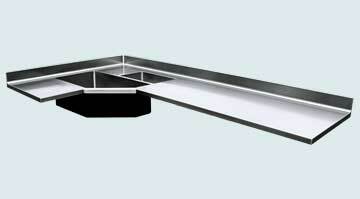 Just browse the Stainless Bar Counter Style to see wide range of Bar Counter products. 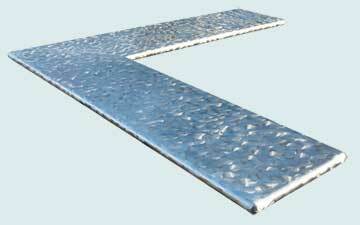 We are glad to answer any questions about any of our Stainless Bar Counter tops. Call 1-800-755-0310 to speak with a product specialist who will help you select and configure your ideal stainless bar counter. Handcrafted Metal Bar Counter and Kitchen Bar are built in a way to be the focal point of your kitchen or Bar.